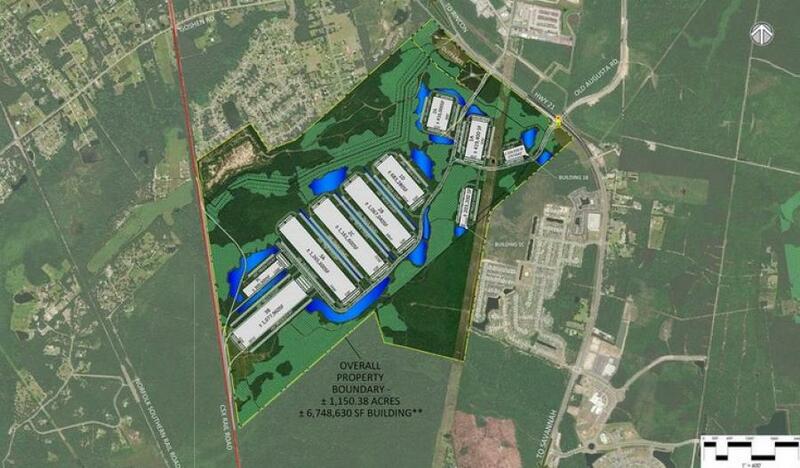 Ground was broken March 26 on a $500 million industrial park in Effingham County. When completed, the Georgia International Trade Center will have up to 7.2 million sq. ft. of light industrial and manufacturing warehouse space on 1,150 acres, according a report in the Savannah Morning News. Phase 1 of the project, consisting of two buildings and related infrastructure, is expected to be completed in March 2020. The center will be strategically located 9.5 mi. from the Georgia Ports Authority and 3 mi. from I-95, and it will have two access points onto state route Highway 21. The park also will be served by rail, creating convenient access to the port. "The Georgia Ports Authority needs warehouse space, and with a vacancy rate hovering at less than 1 percent, the time is right for this project," said Senior Vice President of Development Chance Raehn of Chesterfield, the developer, according to the Morning News. "Depending on the tenants in our park, this project could generate up to 3,000 jobs for our community." In addition to Chesterfield, the development team consists of Stonemont Financial Group and the commercial real estate firm Cushman & Wakefield/Gilbert & Ezelle, all of whom had representatives on hand at the groundbreaking, along with officials from the Ports Authority and Effingham County. "Our timing for delivery of the first two spec buildings early next year will fill a void in the market as the majority of the product currently under construction will deliver and lease up by year-end," said Stephen Ezelle, a partner with Cushman & Wakefield, according to the Morning News. "The early interest we have already received is a testament to the strategic location of the property and strength of the development group. Our total warehouse inventory in Savannah by year-end 2019 will be 70 MSF with a vacancy well below 2 percent, so this new construction at GITC will help meet an important need for the local and regional economy." The first two buildings will be warehouses. Building 1A will be a 419,600-sq.-ft. cross-dock industrial facility with a 36-ft. clearance height, and Building 1B will be a 154,500-sq.ft. rear-load industrial facility with a 32-ft. clearance height.